Programmers are known for using various, ahem, cognitive enhancers (all legal, of course), with coffee as probably the most popular. Well, I’m an avid tea drinker instead, and I’m always on lookout for new flavors, brewing techniques and equipment. Today I’d like to present a perfect example of from the last category. I’ve found it purely by accident while on one of the many trips to IKEA that I’ve undertaken in the last few days. It’s an ingenious teapot that makes it super easy to brew tea, pour it and – finally – get rid of used-up leaves. In the past I used several different types of pots with built-in strainers, as well as standalone infusers, and it was always the cleanup part that turned out to be the most cumbersome. Soaked tea leaves don’t come off easily from infusers’ metallic lattice, requiring to flush the remnants out with direct water stream and risk clogging up the sink (eventually). Overall, it’s just messy, not very clever and hardly user-friendly. but I find this fact irrelevant. Fortunately, the teapot I have found has solved it in a much smarter way. There is no separate insert where the leaves should go. Instead, you are supposed to put them directly inside the glass container and pour water straight into it. This, obviously, seems like an extremely old-fashioned way of brewing tea, but it is also one of the best ones. Leaves are given plenty of space here to spread the flavor throughout the whole pot, rather than being crumpled and confined to the small volume of typical infusers. As a result you may often shorten the brewing time while still getting a richer taste in the end. Problems arise when you’d like to pour some tea into your cup or glass and you don’t fancy getting some of those pesky leaves alongside with it. This is also where the teapot in question shows its ingenuity – or more precisely, it’s the cap of it that does. Designers have equipped it with a piston made of fine-grained lattice that goes up and down the pot’s cylindrical body. 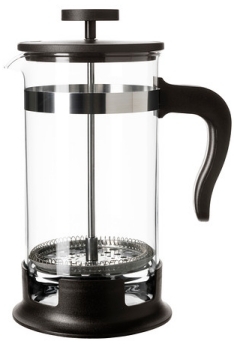 The idea is just bizarrely simple: once your tea has extracted enough goodness from the leaves floating within, you can just press the piston all the way down. This collects all stray leaves and keeps them conveniently at the bottom of the pot, so that nothing gets through when you try to fill your cup. Cleaning is also very easy: you simply run some tap water through the piston and into the glass, flushing the former while keeping all the leaves inside the pot. Afterwards, you just flush everything down the toilet and wash the teapot normally (e.g. in dishwasher). It’s effective, clean and simple. Now that I don’t use Mercurial at work anymore, I’ve found that despite its shortcomings (hg status taking 10+ seconds?!) it has some few nice features. One of those is hg outgoing, which shows you which changesets you are going to send to remote repo in your next push. A quick glance at this list will typically ensure that everything is in order, or allow to amend some commits before making them public. There are few untold assumptions here, like the fact that branch names must match on both local and remote repo. If you find yourself breaking those, then you’re probably better to just use git log directly.